The wound is a break in continuity of skin and mucus membrane. It may arise owing to multiple causes such as mechanical, chemical, and thermal injuries. There are number of treatments available for the acute and chronic wounds but each having its own drawback from the point of view of the reach of below poverty line and common people. Many of them are so much costly that it becomes difficult to adopt them as a mode of treatment, and few others have lesser potency in terms of cure. The aim of this review is to elaborate the properties, pharmacological actions, phytochemical studies, and mechanism of action of the contents of Marham-e-raal which is easily available and affordable. We have taken a deep insight into the Marham-e-raal by collecting and studying the meaningful and scientific data in favor of the same; and made an essential conclusion that it possesses antimicrobial, antiviral, antiseptic, rubefacient, and wound healing properties. According to the Unani literature, Marham-e-raal is used for chronic ulcers to gain intensive and quick response. It helps in growth of healthy tissue at the site of the ulcer. It removes the dead tissue from the site. It is well established formulation for the ulcers which are resilient to healing. The molecular basis of action of Marham-e-raal is that it aids in the enhancement of collagen concentration with stabilization of fibers at wound bed. It aids in wound contraction by increasing the epithelialization period. Mom (bees wax) is an important content of the Marham (ointment) and improves the action of its contents. It helps in penetration of the contents of a Marham into the tissues of ulcers because the constituents of the Marham are desiccant and astringent and without Mom (bees wax) fail to penetrate.Kafoor (Cinnamomum camphora) has antiseptic, stimulant and rubefacient activity. When applied locally, Kafoor dilates the blood vessels and increases the circulation at the site. It has antiseptic, demulcent, and anodyne properties.,Raal hindi (Vateria indica Linn) has detergent activity. It washes the wound and makes the wound free from the pus. Its ointment is beneficial to long-standing wounds.Raal hindi has anti-parasitic property and rubefacient activity.Kaat hindi (Acacia catechu) is used for itching, burn ulcers, and syphilitic ulcers in the form of an ointment. 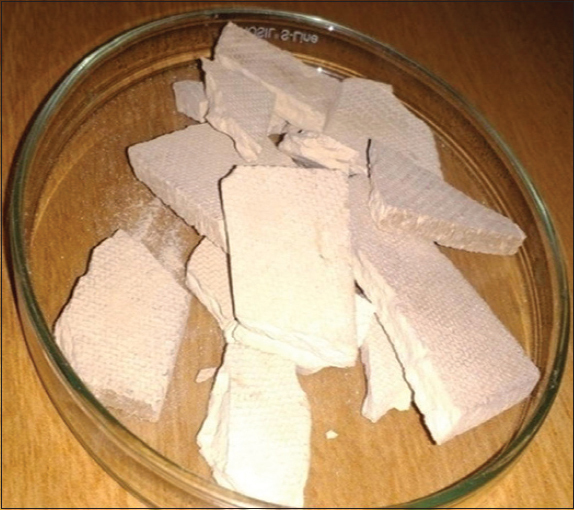 Dispersion of its sufuf (Powder) over an ulcer stops bleeding.Kaat hindi has been reported for having strong astringent and antiparasitic property., In a controlled study of Marham-e-raal conducted by Mokhtar et al., it was found that the contraction of wound at day “15” by Marham-e-raal was 98.93% as compared to control group where it was 90.3%, P < 0.01. Moreover, the period of epithelialization by Marham-e-raal was faster than the control group (16.00 ± 0.36 vs. 21.33 ± 0.21 days; P < 0.01). Kafoor (C. camphora), Kaat hindi (Acacia catechu), Raal hindi (Vateria indica Linn), Mom (Bees wax/Cera), Roghan-e-gao/Ghee or clarified butter. Each content of Marham-e-raal has been described below in detail. 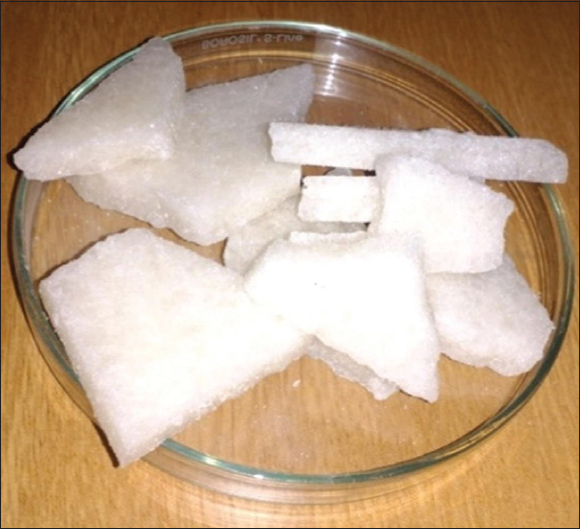 Camphor (C. camphora), [Figure 1], is a white, crystalline substance with a strong odor and pungent taste, derived from the wood of camphor laurel (C. camphora) and other related trees of laurel family. Camphor tree is native to China, India, Mongolia, Japan, and Taiwan and a variety of this fragrant evergreen tree is grown in Southern United States; Especially in Florida. Actions/Af'al: Beneficial for tap-e-diq (Tuberculous fever),Mufarreh (exhilarant),,Daf'e fasad-e-hawa (Air purifier)., Camphor oil as analgesic if applied locally, it possesses actions such as Daf'e Ta'affun (anti-septic), Muharrik (stimulant), and Khushk kunanda (dessicant); therefore, dilates the blood vessels if applied locally. It is Analgesic, antibacterial, anti-itch, antiseptic, candidcide, fungicide, rubefacient,Muharrik (stimulant), musakkin-e-alam (analgesic), and muhammir (rubefacient). Ethanolic extract of fruits shows antibacterial activity against several Gram-positive and Gram-negative bacteria. The essential oil from the plant possesses antifungal activity against many fungi. As evidenced by Vaghardoost et al., an herbal ointment containing camphor as its constituent had shown good effect on 2nd degree burn in terms of epithelialization and neovascularization as compared to control drug; Vaseline. Uses/Ista'mal: The decoction of coriander along with kafoor stops bleeding from the nose.Kafoor along with the Aab-e-kishneez (decoction of coriander) is analgesic for an earache if used as a drop. If sprinkled over the wound cleans up and heals up the wound. The fine powder is used for skin diseases along with other essential drugs. The spirit of camphor if applied on bed sore, no further extension is estimated. It is applied externally as antiseptic and anodyne in the form of ointment or tincture. The camphor from the trunk wood possesses cardiac, analeptic, antivecterial, demulcent and anodyne properties. Injection of camphor oil and sodium camphosulfonate are prescribed in case of cardiac collapse. The administration of camphor is effective for fever, colic, sore throat, and impotence.Kafoor in the form of ointment is applied over the wound to stop bleeding and provide taskeen (relief) from the hararat (warmth) and sozish (burning) of wound Stimulant of heart and circulation as well as respiration. Topically used as a rubefacient and mild analgesic. Camphor is used as antiseptic, anti-cold, for anti-insect bites, antimicrobial, embalming, firework, U. V filter cream, topical analgesic, anti-itching, skin cooling, antiburns, and sunburn. Dosage/Miqdar-e-khurak: 5–8 grain, 1–3 ratti, Topical ointment with 3%–11% camphor. Compound formulations/Murakkabat: Qurs tabasheer kafoori, Tiryaq-e-azam. Evergreen tree about 15 meter tall, trunk bark thick, and grooved. Leaves alternate and coriaceous, long petiolate, shining on the upper side, 3 nerved at the base. Inflorescence in the axillary penicle, shorter than the leaf; flowers small, greenish yellow. Cultivated as shade tree in subtropical and tropical regions. A tree native to China and Japan and often grown as a hedge plant. Major oil constituent of C. camphora are camphor, linalool, borneol, camphene, dipentene, terpineol, safrole, and cineole. However, only camphor, linalool, borneol, and cineole have been proved to be efficient in the mechanism of wound healing and relieving pain through a number of pathways. Camphor activates some of the transient receptor potential (TRP) channels such as TRPV1, TRPV3, TRPM8, and inhibits TRPA1, causing warm sensation, excitation, and desensitization of sensory nerves, relieving the pain, itch and irritation in the applied area., Linalool has been reported for insecticidal activity against some stored insects (Ryan and Byme, 1988; Weaver et al., 1991; Sanchez-Ramos and Castanera, 2001) Linalool has antifungal (Duman et al., 2010; Ozek et al., 2010) and antimicrobial activities (Duman et al., 2010; Park et al., 2012). Carson and Riley (1995) and Peana and Moretti, 2002 have demonstrated that Linalool is effective against Candida albicans, Escherichia More Details coli, and Staphylococcus aureus, but not against Pseudomonas aeruginosa. Linalool has antioxidant properties and antinociceptive property. The healing properties of borneol are attributed to the properties such as Analgesia, putridity elimination, and flesh regeneration, and repair of damaged cells. The cineole has antibacterial, antifungal, insecticidal, anti-inflammatory, antiparasitic, repellent, antioxidant, and analgesic properties. The antibacterial effect was investigated against Klebsiella spp., Proteus spp., Pseudomonas spp., E. coli, and S. aureus. Acacia catechu is a deciduous tree with a light feathery crown and dark brown, glabrous, slender, thorny, shining branchlets, usually crooked. Bark dark brown or dark grey, brown or red inside, nearly 12–15 mm in thickness, rough, exfoliating in long narrow rectangular flakes which often remain hanging. Blaze very hard, color brown, and deep pink [Figure 2]. Branchlets armed with pseudo-stipular spines in pairs below the petioles. Pod 10–15 cm by 2–3 cm, thin, straight, flat, glabrous dark-brown, and shining when mature. Seeds 3–8, about 5 mm in diameter. Synonyms: Acacia wallichiana, Mimosa catechu. Actions/Af'al: Qabiz (Astringent/styptic), Musaffi khoon (blood purifier), Mujaffif (desiccant).,,Mujaffif-e-zakhm (desiccant of wound), therefore it is sprinkled over the wounds. Uses/Iste'mal: Due to its Mujaffif action, it is used in ulcers either singly or as a content of ointment. It is beneficial in hemorrhage of gums. Astringent, It is useful in passive diarrhea either alone or in combination with Cinnamomum or opium. A decoction of it is given internally in leprosy. It applied externally in ulcers, boils, skin eruptions, and allergy. Antidiarrhoeal, hemostatic; used for treating excessive mucous discharges and hemorrhages. It is also used as an antileprotic drug. The Ayurvedic Pharmacopoeia of India indicates the use of dried pieces of heartwood in inflammations, skin diseases and recommends its use as a blood purifier. The paste of it along with Mom is beneficial in boils and wounds. The fine powder of it, if sprinkled over the wound, stops the bleeding. The powder of it mixed with clarified butter heals boils. Not recommended in/Muzir: Zo'fe bah. Musleh: Mushk (Musk), Ambar (Ambegris). An evergreen tree about 15 m. tall. Trunk bark thick and grooved. Leaves alternate and coriaceous, long petiolate, shining on the upper side, 3 nerved at the base. Inflorescence in the axillary panicle, shorter than the leaf; flowers small, and greenish yellow. Acacia catechu contains flavonoids; kaempferol, quercetin, catechin, and terpene; camphor and phytol. V. indica Linn. Dipterocarpaceae is a perennial woody plant. It is a slow-growing species, Endemic and found mainly in the Southwest coast evergreen forests. It is found up to an altitude of 750 m, and also occasionally in secondary evergreen dipterocarp forest in the states of Karnataka, Kerala and Tamil Nadu. The woody plant V. indica Linn. is distributed in India and Sri Lanka, and the resin; [Figure 3] has been used as a traditional medicine in number of diseases. English: Indian copal tree, piney varnish-tree, white dammar,, resin. Uses/Iste'mal: It is used in skin eruptions, leprosy, cough, asthma, wound, ulcers, and anemia., Two masha of raal along with semi-boiled egg yolk relieves cough, asthma and lung ulcers., The local application is beneficial for ulcers and itching., If used with Gulnaar (Punica granatum), beneficial for nawaseer (sinuses) and pile masses. If used with safeda, beneficial for ulcers and works as munbit-e-lahem (Meat grower). It is used in ointments which is further used for local application on ulcers. Resin enters into a number of antiseptic and anti-inflammatory ointments. Resinous exudates – 1–2 g.
Not recommended in/Muzir: For individuals having the hot temperament. Musleh: Roghan, milk, and fat. Habitat: In the Western Ghats, up to 1200 meters along the stream. 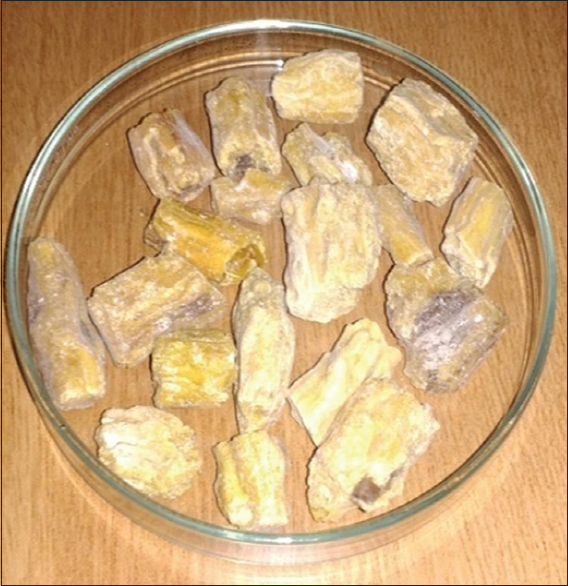 The aqueous and ethanolic extract of V. indica linn contains alkaloids, terpenoids, glycosides; bergenin, phenol; resveratrol, viniferin and hopephenol, and flavonoids and tannin. Alkaloids possess analgesic activity. Terpenoids are known for their antiviral, anthelmintic, antibacterial and anti-inflammatory properties. Bergenin, a natural secondary metabolite glycoside, has been known for antifungal and antibacterial,, antiviral, anti-inflammatory, antiulcerogenic, antidiabetic, and wound healing properties. Phenols and flavonoids have an antioxidant, antiallergic, and antibacterial properties. Saponins are reported to have anti-inflammatory and antiviral. It has been demonstrated that hopeaphenol, a type of phenol, has various effects, namely anti apoptoic effect, anti-inflammatory, antitumor, and antimicrobial effects. It also possesses selective anti-apoptotic property in nonproliferative cells. Viniferin is also a resveratrol which is a type of phenol found in tetramer containing the same properties. The stem of V. indica linn. is known to produce biologically active compounds such as oligostilbenoids and monoterpenes. Oligostilbenoids are known to have antifungal activity. Monoterpenes is a potent anti-inflammatory drug. Studies have shown that both natural monoterpenes and their synthetic derivatives are endowed with various pharmacological properties including antifungal, antibacterial, antioxidant, anticancer, local anaesthetic, antinociceptive, and anti-inflammatory. The beeswax which is widely used is produced by species Apis mellifera and Apis cerana, [Figure 4]. These species are most bred by human and therefore, it provides easier access to this bee product. Beeswax is a complex product which is secreted in liquid form wax glands present in the abdomen of younger worker bees (aged between 12 and 18 days), and at the end of this period, the bees act as nurses. In contact with the air, it solidifies in scales. The pure beeswax is almost white at the time when it is secreted from the bees, turns intense yellow when comes in contact with honey and pollens, and turns brown after about 4 years because it contains the cocoon. It is insoluble in water and cold alcohol; it dissolves partially in boiling alcohol, and completely in chloroform, in carbon disulfide, and in the essence of hot turpentine. It melts at temperatures between 63.5°C and 64.5°C. It turns into a buttery mass which is called wax oil if subjected to a dry distillation. Mizaj: Hot and wet,, Motadil. Uses/Iste'mal: It is an essential part of the majority of ointments.,, The small pieces, when used along with roghan-e-kunjud, proves to be beneficial in internal ulcers of the body, loose stools, pain in chest, cough, and tuberculosis.,Tila of Mom with roghan-e-banafsha is beneficial in itching of skin and proves to be munzij-e-waram. It helps in penetration of the contents of a Marham (ointment) into the tissues of ulcers because the constituents of the Marham are desiccant and astringent and without Mom (bees wax) fail to penetrate. Dosage/Miqdar-e-khurak: ½ to 1 masha. Beeswax is a complex mixture (more than 300 components) of hydrocarbons, free fatty acids, esters of fatty acids and fatty alcohol, diesters, and exogenous substances. 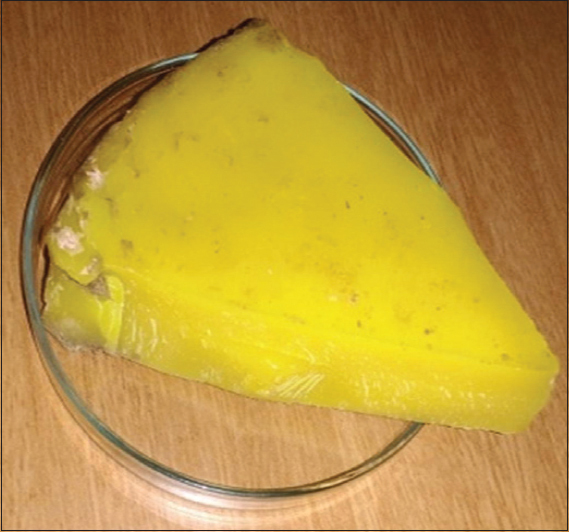 The crude beeswax showed antibacterial activity against several bacterial strains and against the C. albicans yeast. 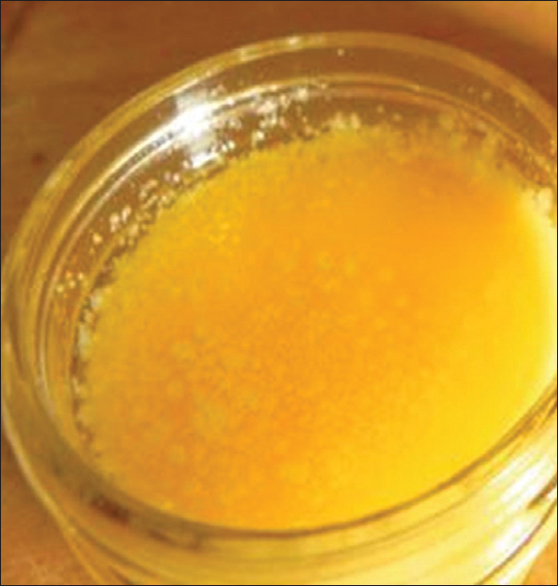 The sample of beeswax has proved effective against both Gram-positive and Gram-negative bacteria. Cow's ghee, [Figure 5] is known to have antiulcer activity and therefore has been reported to exhibit significant wound healing properties. The antifungal activity of Roghan-e-gao has also been known to be independent of any antifungal drug. Cow Ghee is very well known to contain various saturated and unsaturated fatty acids which take part in metabolic processes concerned in wound healing. Wound healing is credited to muhallil (anti-inflammatory), daf'e ta'ffun (antimicrobial), mujaffif (desiccant) and mundamil (wound healing) properties of Marham-e-raal due to presence of several phytoconstituents such as camphor (analgesic), Linalool (antifungal, antimicrobial, and insecticidal), borneol (analgesic, munbit-e-lahem/Meat grower, and desloughing agent), cineole (antibacterial, antifungal, insecticidal, anti-inflammatory, antiparasitic, repellent, antioxidant, analgesic), terpenoids (antiviral, anthelmintic, antibacterial, anti-inflammatory), Bergenin (antifungal, antibacterial, antiviral, anti-inflammatory, antiulcerogenic, wound healing properties), phenols and flavonoids (antioxidant, antiallergic, antibacterial), hopeaphenol (anti-apoptotic, anti-inflammatory, antimicrobial), oligostilbenoids (antifungal), Monoterpenes (antifungal, antibacterial, antioxidant, local anaesthetic, antinociceptive, anti-inflammatory), kaempferol (antibacterial, anti fungal), quercetin (anti-ulcer, anti-inflammatory), and Catechin (vasodilator). We are grateful to all our teachers and junior PG Scholars for their support and helpful hand in collecting the deep insightfulness of the materials related to the article. Kareem HM. Keemya-e-Anasiri (An Urdu Translation of Qarabadein Qaadri written by Arzani HA). New Delh: CCRUM; 2006. p. 769. Mokhtar MA, Ahmad MA, Nizami Q, Ahmad FJ, Rahman MM. Wound healing effect of a Unani formulation Marham-e-Ral in albino rats. Int J Adv Pharm Med Bioallied Sci 2014;2:20-4. Ghani HN. Khazain-ul-advia. New Delhi: Idara Kitab-us Shifa; YNM; 1276. p. 1002, 1003, 720, 1022. Nadkarni's KM. Indian Meteria Medica. Vol. 2. Mumbai: Popular Prakashan Private Limited; 1976. p. 245, 240. Prajapati ND, Purohit SS, Sharma AK, Kumar T. A Handbook of Medicinal Plants. Publication No. 142. Vol. 4. Jodhpur: Agrobios (India); 2009. p. 533. Zuccarini P. Camphor: risks and benefits of a widely used natural product. J Appl Sci Environ Manage 2009;13:69-74. Arzani MA. Qarabadain Qadri. New Delhi: CCRUM; 2009. p. 759. Frizzo CD, Santos AC, Paroul N, Serafini LA, Dellacassa E, Lorenzo, et al. Essential oils of camphor tree (Cinnamomum camphora NEES & Eberm) cultivated in Southern Brazil. Braz Arch Biol Technol 2000;43:313-6. Chelliah Abiya D. Biological activity prediction of an ethno medicinal plant Cinnamomum camphora through bioinformaticts. Ethnobotanical Leafl 2008;12:181-90. Segal S, Cohen SN, Freeman J, Hill RM, Kagan BN, Kauffman R, et al. American Academy of Pediatrics. Committee on Drugs. Camphor: Who needs it? Pediatrics 1978;62:4046. Nadkarni's KM. Indian Meteria Medica. Vol. 2. Mumbai: Popular Prakashan Private limited; 1976. Duke JA. Handbook of Medicinal Herbs. 2nd ed. New York; CRC Press; 2006. Prajapati ND, Purohit S.S, Sharma AK, Kumar T. A handbook of Medicinal Plants. Jodhpur: Agrobios (India); 2009. p 4, 142, 533. Khare CP. Indian Medicinal Plants. New Delhi: Springer (India) Private Ltd.; 2007. Hakeem MA. Bustanul Mufaradat. New Delhi: Idara Kitab-us-Shifa; 2002. Ghani HN. Khazain-ul-advia. New Delhi: Idara Kitab-us shifa; YNM. Kabiruddin AM. Makhzanul Mufaradat. New Delhi: Idara Kitab-us-Shifa; 2007. Vaghardoost R, Mousavi Majd SG, Tebyanian H, Babavalian H, Malaei L, Niazi M, et al. The healing effect of sesame oil, camphor and honey on second degree burn wounds in rat. World J Plast Surg 2018;7:67-71. Shahabi S, Jorsaraei SGA, Moghadamnia AK, Zabihi E, Aghajanpour SM, Kani SNM, et.al. Central effects of camphor on GnRH and sexual hormones in male rat. IJMCM Autumn 2012;1:191-6. Singh R, Jawaid T. Cinnamomum camphora (Kapur): Review. Pharmacogn J 2012;4:1-5. Hamidpour R, Hamidpour S, Hamidpour M, Shahlari M. Camphor (Cinnamomum camphora), a traditional remedy with the history of treating several diseases. Int J Case Rep Images 2013;4:86-9. Tripathi AK, Mishra S. Plant monoterpenoids (Prospective Pesticides). Ecofriendly Pest Management for Food Security. 2016. Peana AT, D'Aquila PS, Panin F, Serra G, Pippia P, Moretti MD, et al. Anti-inflammatory activity of linalool and linalyl acetate constituents of essential oils. Phytomedicine 2002;9:721-6. Xiong ZY, Xiao FM, Xu X, Wu YF, Jiang XM. Studies on pharmacological activity of borneol. Zhongguo Zhong Yao Za Zhi 2013;38:786-90. Al-Snafi AE. The pharmacological and therapeutic importance of Eucalyptus species grown in Iraq. IOSR J Pharm 2017;7:72-91. Forest Research Institute. Indian Council of Forestry Research and Education. Khair (Acacia catechu). Dehradun: Forest Research Institute; 2010. p. 24. Chowdhury AR, Banerji R, Misra G, Nigam SK. Chemical composition of acacia seeds. J Am Oil Chem Soc 1983;60:1893-4. Calderón-Montaño JM, Burgos-Morón E, Pérez-Guerrero C, López-Lázaro M. A review on the dietary flavonoid kaempferol. Mini Rev Med Chem 2011;11:298-344. Chen AY, Chen YC. A review of the dietary flavonoid, kaempferol on human health and cancer chemoprevention. Food Chem 2013;138:2099-107. Negi BS.In vitro antimicrobial activity of Acacia catechu and its phytochemical analysis. Indian J Microbiol 2010;50:369-74. Hooper L, Kay C, Abdelhamid A, Kroon PA, Cohn JS, Rimm EB, et al. Effects of chocolate, cocoa, and flavan-3-ols on cardiovascular health: A systematic review and meta-analysis of randomized trials. Am J Clin Nutr 2012;95:740-51. Ellinger S, Reusch A, Stehle P, Helfrich HP. Epicatechin ingested via cocoa products reduces blood pressure in humans: A nonlinear regression model with a Bayesian approach. Am J Clin Nutr 2012;95:1365-77. Tamilselvan A, Karuthapandian S, Mehalingam P. Biosynthesis of silver nanoparticles using leaf Extract of Vateria indica L and their antimicrobial efficacy. Int J Biosci Nanosci 2016;3:36-9. Shrijani JK, Hegde K, Shabaraya AR. Review on pharmacological activities of Vateria indica linn. Int J Pharma Chem Res 2018;4:5-9. Bajracharya GB. Diversity, pharmacology and synthesis of Bergenin and its derivatives: Potential materials for therapeutic usages. Asian Pac J Trop Dis 2012;2:163-7. Seya K, Kanemaru K, Sugimoto C, Suzuki M, Takeo T, Motomura S, et al. Opposite effects of two resveratrol (trans-3,5,4'-trihydroxystilbene) tetramers, vitisin A and hopeaphenol, on apoptosis of myocytes isolated from adult rat heart. J Pharmacol Exp Ther 2009;328:90-8. Ge HM, Huang B, Tan SH, Shi da H, Song YC, Tan RX, et al. Bioactive oligostilbenoids from the stem bark of Hopea exalata. J Nat Prod 2006;69:1800-2.
de Cássia da Silveira e Sá R, Andrade LN, de Sousa DP. A review on anti-inflammatory activity of monoterpenes. Molecules 2013;18:1227-54. Kozioł A, Stryjewska A, Librowski T, Sałat K, Gaweł M, Moniczewski A, et al. An overview of the pharmacological properties and potential applications of natural monoterpenes. Mini Rev Med Chem 2014;14:1156-68. Fratini F, Cilia G, Turchi B, Felicioli A. Beeswax: A minireview of its antimicrobial activity and its application in medicine. Asian Pac J Trop Med 2016;9:839-43. Scientific opinion of the panel on food additives, flavourings, processing aids and materials in contact with food (AFC) on a request from the commission on the safety in use of beeswax. EFSA J 2007;615:1-28. Biyani DM, Verma PR, Dorle AK, Boxey V. A case report on wound healing activity of cow ghee. Int J Ayurvedic Med 2011;2:115-8.